Reliable, clear communication represents a key pillar to the success of law firms. Legal professionals work in an environment that requires they procure fast, accurate information. Missed messages and crossed communications can result in delays, upset clients, or devastating mistakes. The right business telephone solution can streamline daily operations, reduce call abandonment rates, and increase productivity. This saves time, money, and reputation. How can any firm, regardless of size, possibly keep up with it all and not miss critical information and communications? The best law firms handle this and more with ease (and at a much lower cost) by implementing a solution that integrates all of these communication platforms. This allows vital information to travel seamlessly across telephones, computers, mobile devices, and locations. A customized, fully integrated telecommunications solution can greatly benefit your legal firm — as long as it’s simple and inexpensive to implement. That’s the great thing about Action Communication and our comprehensive solutions. They’re easy to deploy, manage, and use regardless how many locations or staff members your firm has. Fully integrated. Our solutions not only integrate seamlessly across all communications platforms and media, but also integrate with resident CRM, accounting, and ERP software. Transcription, fax, and call recording. Capture vital information as it happens with automatic voice message transcription, call recording, and digital fax services. Scalable. Our solutions are completely scalable and grow as your law firm expands, adds locations, and hires staff to service these locations. In fact, they’re so easy to implement and use, they have little to no impact on IT. Mobility. Today’s professionals need a flexible, mobile working model. The right phone system extends the office to any location imaginable, allowing staff to access those same powerful features on their smartphones or tablet devices.  Choose from a full array of communications solutions offered by Action Communication. We’ll take time to fully understand your specific needs so your new system will help your firm deliver excellence in client services while decreasing expenses.